Egyptians Go To Polls With Opposition Largely Silenced : The Two-Way Arrests and other intimidation have kept critics from being able to organize and speak out. The interim government's message: If you're really an Egyptian than you'll vote yes. Opponents say the new constitution further enshrines the military's role in Egyptian life. A woman casts her ballot Tuesday at a polling station in Nasr City, Cairo. 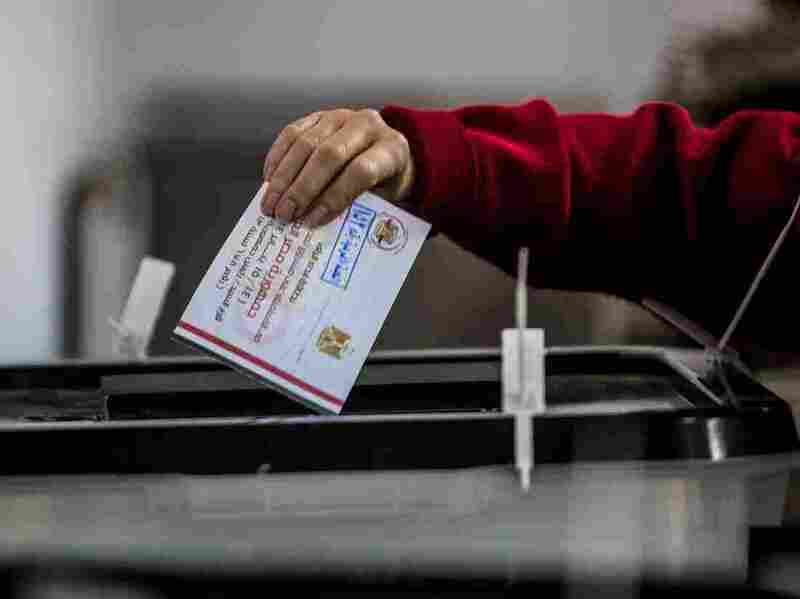 As Egyptians begin voting on a new constitution, the opposition to the huge role that nation's military plays in life there has been pushed to the side, NPR's Leila Fadel reported Tuesday from Cairo. On Morning Edition, she told host Renee Montagne that the arrests of those who try to oppose the interim government and military authorities have led many critics of the new constitution to boycott the two-day vote. They believe that "human rights are not being respected and the path to democracy is in danger," Leila said. The only posters and ads you see about the vote, said Leila, tell people to support the new constitution. The message, she says, is that "if you're really an Egyptian than you'll vote yes." As The Associated Press reminds readers, the voting today and Wednesday marks "a milestone in a military-backed roadmap put in place after Mohammed Morsi was overthrown in a coup last July." Morsi was Egypt's first democratically elected president. He was in office for only about one year. He was put there thanks to the support of his Muslim Brotherhood party. But Morsi soon fell out of favor with many Egyptians, who were angry about the nation's economic troubles and felt that Morsi was favoring his supporters and their agenda. Protests were followed by the military coup — Egypt's second such toppling in recent years. President Hosni Mubarak was driven from office in February 2011. "The two-day balloting is widely seen as a referendum on a likely presidential run by Egypt's top general — but held in a climate of fear and intimidation. "It's also the first test at the ballot box for the popularly backed coup that ousted the Islamist Morsi and his Muslim Brotherhood. A comfortable 'yes' vote and a respectable turnout would bestow legitimacy on the cascade of events that followed the coup while undermining the Islamists' argument that Morsi remains the nation's elected president." According to the BBC, "a huge security operation is being mounted for the two days of voting. The interior ministry says 200,000 police officers, 150 central security units and 200 combat groups are being deployed around polling stations on both days." The heavy security hasn't prevented some violence. "A man has been killed in clashes between security forces and supporters of ousted president Mohamed Morsi outside a polling station south of Cairo," The Guardian says. "The death of Mahmoud Sayed Gomaa, 25, in Bani Suef, came hours after a bomb exploded outside a courthouse in north-western Cairo shortly before polling stations opened." As for the new constitution, Leila reports that on some issues — women's rights, children's rights and minorities' rights — it is much like the constitution that Morsi's government put forward. But what concerns many Egyptians, she says, is that is also "further enshrines the military's role in Egyptian life."